Pianist/composer Jacques Loussier demonstrated musical ability at an early age, starting to play at the age of 10 and entering the Conservatoire National de Musique in Paris at 16. Loussier's main professor there was Yves Nat, who in turn was encouraged by Faure, Saint-Saens and Debussy as a student himself. Loussier continued this distinguished tradition, graduating at the top of his class. After travelling the world as an accompanist, in the late '50s Loussier formed the Play Bach Trio with Pierre Michelot and Christian Garros. 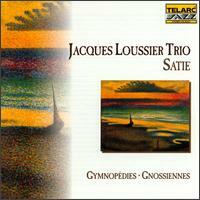 The Trio fused Loussier's classical background with his interest in jazz, using Bach's compositions as the basis for improvisation. The group was an immediate success, playing many shows and selling over six million albums in 15 years. By the end of the '70s, however, the group ran its course and Loussier retired to Provence, spending his days composing and recording at his studio in Miraval, experimenting with electronic and acoustic arrangements. The studio also played host to rock artists like Pink Floyd (including sessions for The Wall), Elton John and Sting. 1985 marked the 300-year anniversary of Bach's birth, which promted Loussier to reform the Play Bach Trio with new members and a wider musical range, adding rock and electronic elements to the basic blend of classical and jazz. Loussier also continued composing through the '80s and '90s, as well as performing pieces by Bach and Ravel live and on albums like 1999's Ravel: Bolero and Bach Book 40th Anniversary Album with his signature jazzy flair. A year later, Take Bach and Music of Debussy were released.